Draft: 2009, St. Louis Cardinals, 23rd rd. Matthew James Adams...Graduated from Philipsburg-Osceola (PA) High School...Owns several offensive career records at Osceola including batting average (.473), home runs (16), RBI (95) and doubles (28)...Garnered All-State honors as a catcher his senior season...Attended Slippery Rock (PA) University from 2007 to 2009 and holds career records for batting average (.453) and slugging percentage (.754)...Was named Pennsylvania State Athletic Conference West's Rookie of the Year in 2007 and PSAC West Player of the Year in 2009...Earned PSAC West first-team honors all three years... Named Division II All-American in 2009 (1st-team), 2008 (2nd-team) and 2007 (3rd-team)...Played for the Pittsville Dukes of the New England Collegiate Baseball League the summer of 2008. Hit .257 with nine doubles, 18 home runs, 48 RBI, 24 walks and 37 runs scored in 94 games with Washington...He recorded a .510 slugging percentage and an .842 OPS before being traded to the St. Louis Cardinals on Aug. 21...In 121 games between the two clubs, he clubbed a career-high 21 home runs while recording 57 RBI and a .477 slugging percentage...As a member of the Nationals, Adams posted a .538 slugging percentage against right-handed pitchers, good for eighth among National League hitters (min. 230 PA vs. RHP) at the time of the trade...Of his 21 home runs in 2018, 20 came at the expense of right-handed pitching...While in Washington, he saw action at first base (48 G), left field (15 G) and right field (1 G)...When he took the field as a starter in 2018, the Nationals posted a 37-22 (.627) record...In those 59 starts, he hit .269/.339/.546 with nine doubles, 17 home runs and 42 RBI... Recorded mutli-home run games on May 1 vs. Pittsburgh (3-for-4, 2 HR, 3 RBI) and May 7 at San Diego (2-for-4, 2 HR, 5 RBI)... Matched a career-high with six RBI on April 25 at San Francisco (3-for-5, HR, 6 RBI)...He returned to Nationals Park as a member of the Cardinals on Sept. 5 and recorded his third multi-home run game of the season (eighth of his career). Began the season with St. Louis before being acquired by Atlanta on May 20... Clubbed 19 home runs for the Braves, tying the single-season Atlanta franchise record for a mid-season trade acquisition (Fred McGriff, 19 in 1993)...During his stint with the Braves, 40 of his 79 hits went for extra bases (20 2B, 3B, 19 HR) and his .543 slugging percentage during this stretch ranked 11th in the National League among hitters - and fifth among left-handed batters - with at least 290 at bats...Went 13-for-46 (.283) with two doubles, two home runs, and 13 RBI as a pinch-hitter between both clubs...His 13 pinch-hit RBI ranked tied for second in Major League Baseball...Primarily a first baseman throughout his career (425 games/387 starts), Adams displayed his versatility by appearing in 19 games (18 starts) in left field... Having never played the outfield in his Major League career prior to 2017, Adams committed just two errors and recorded a .926 fielding percentage... Ranked tied for 11th in the National League with 29 RBI from the seventh inning and beyond. Tied for 1st among MLB pinch-hitters in doubles (5) with Rickie Weeks. Ranked among MLB leaders in pinch home runs (3, T5th), RBI (13, 2nd), hits (12, T6th), batting average (.324, 6th) & slugging percentage (.703, 4th)...Hit his second career walk-off home run, a 16th inning shot vs. LAD (7/22) coming off Bud Norris. Was his 50th career home run, 3rd career extra inning home run and 2nd in the 16th inning (9/4/13 at CIN)...Batted .333 (27-81) with runners in scoring position...Fifteen of his last 24 hits were extra-base hits (8 2Bs, 7 HR)...Hit three pinch hit homers, T5th-most in the Majors. His 7 career pinch homers as a Cardinal rank 2nd in franchise history behind George Crowe (8)...Seven of his 16 homers tied or gave St. Louis the lead. Twenty-three of 55 career homers have tied or given Cardinals lead...Posted a 10-game hitting streak (5/30-6/10), batting .361...Reached base safely in 21 straight games (5/17-6/10), raising average from .260 to .338 (.400 BA; 26-65, 7 2B, 5 HR, 20 RBI)...Had 19 RBI in May, T10th among N.L. players and his most in any month in his career...Had 3 hits & 3 RBI on 5/12 at LAA...Collected a season high 4 RBI on 5/19 vs. COL in a 13-7 Cardinals win...Hit game-tying two-run pinch-hit home run vs. CHI (5/23) off John Lackey in the 7th inning of a game the Cardinals rallied to win in walk-off fashion 4-3...Missed 19 games with right shoulder inflammation (8/10-9/1)...played 5 rehab games at Memphis (AAA) (.188, HR, 2 RBI)...Hit a home run into the Allegheny River at PIT (9/6), joining Jim Edmonds, J.D. Drew, Colby Rasmus and Matt Carpenter as Cardinals to accomplish the feat at PNC Park...Homered in consecutive games twice (7/22-23 vs. LAD & 9/5-6 at PIT). 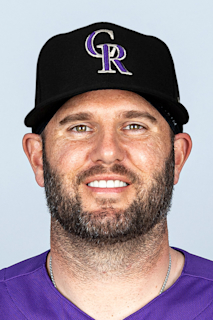 Had injury shortened season, missing 91 games with a right quadriceps tear that required surgery on 5/29 (Dr. Dave King)…Injured quad running out a double on 5/26 vs. ARI; was on the disabled list 5/27-9/9…Four of his five home runs came before his stint on the DL; St. Louis went 5-0 in games he had a home run…Had 5 game-winning RBI…Was 6-16 (.375) as a pinch hitter, T2nd most pinch hits for STL. Went 4-10 as a pinch hitter upon return from the DL…Batted .304 in April. His longest hitting streak of the season started at the end of the month, six games from 4/28-5/3, including four multi-hit games (.480,12-25, 3-2Bs, HR, 7 RBI)…Blasted 2-run, pinch-hit homer at CIN on 9/13, his 4th career pinch-hit homer, ranking T5th on Cardinals all-time list…Recorded an RBI in 4 straight games, matching a team high, 4/28-5/1…Had a walk-off single in the 10th vs. PIT on 5/1…Activated from the DL on 9/10 and made seven starts at first (8 apps. ); had 35 starts at first (38 games) prior to his injury. Led team with a .288 batting average, ranking 14th in the N.L. It marked first time since 1986 (Ozzie Smith, .280) that the Cardinals team BA leader was under .290...His 13 game-winning RBI ranked T14th among N.L. leaders and he was T9th with 7 sacrifice flies...Ranked 9th in N.L. home batting (.313)...Led Cardinals in slugging (.457), intentional walks (5) and tied for the team lead in triples (5). Had not received an IBB in MLB prior to 2014. Ranked 3rd on team with 54 extra base hits and 41 multi-hit games...Posted his single-season highs in doubles (34), runs batted in (68), walks (26), intentional walks (5), runs (55) and hits (152)...His 5 triples were the most by a Cardinals first baseman since Keith Hernandez (6) in 1982...Batted over .300 in April (.314), May (.329) and June (.328)...Placed on the 15-day disabled list 5/31 with left calf tightness. Missed 13 games...Hit safely in 12 straight road games 5/10-7/1 and had a career-best 9-game hit streak from 7/3-11...Homered in a team-high three straight games June 13-15 (vs. WSH) and became the first Cardinals since Ozzie Smith (1988) with a game-winning RBI in four straight games (6/13-16)...Had 3rd career multi-HR game at COL on 6/23 with career-high 6 RBI...Had a career-high four-hit game vs. MIA (7/6)...Hit his first career walk-off home run vs. PIT (7/7) in 2-0 win...Started all nine postseason games at first base for St. Louis and hit three home runs that produced five runs, while collecting seven RBI during the postseason...walked a team-high 5 times during the playoffs...collected an RBI single in the Cards 8-run 7th in Division Series Game 1 vs. Los Angeles Dodgers...Hit decisive 3-run home run in Game 4 (7th inning) to give Cards a 3-2 game win and Division Series win...Hit solo HR in the 8th of League Championship Series vs. San Francisco in Game 2 for then go-ahead run...he and Brian Jordan (1996) are the only Cardinals players in franchise history to hit two go-ahead HRs in the 7th inning or later in the same postseason...his 4th-inning solo home run in LCS Gm 4 briefly tied the game at 2-2...two of his three home runs in the postseason came off of left-handed pitchers (C. Kershaw DS Gm 4, M. Bumgarner LCS Gm 5); tallied only 3 HRs off LH pitchers in 130 PA (121 ABs) during the regular season...his HR off Bumgarner was the first the lefty had allowed in 32 starts (since 4/11). Began the season on the Major League roster for the first time... Ranked 3rd on the team with 17 HR in 108 games; St. Louis was 13-2 when he homered. Nine of his 17 home runs were hit with two-strike counts, most on STL and T8th in NL... Averaged 17.61 AB/HR, ranking 6th in the N.L. (min. 250 AB)... Led the Majors in pinch-hitting batting average (.314) and the National League in PH slugging (.600). Had three pinch-hit home runs, one shy of STL season record... Batted .329 with runners in scoring position (28-85)... Began the season with two three-hit games and four multi-hit games in his first five games, during a season-best hitting streak of five games (4/3-14)... Was batting .542, 3 HR, 8 RBI before missing 13 games with a right oblique strain, 4/22-5/6... Hit a career-best eight home runs in September, 3rd in MLB, and slugged .609 (5th, NL)... Had two multi-home run games (6/29 at OAK & 9/4 at CIN)... His multi-HR game at CIN (9/4) was the first time a Cardinals player hit two extra inning HRs (14th, 16th) & first player in MLB history with 2 HRs past 14th inning... Pressed into starting role following Allen Craig's injury (9/4) batting .326 (29-89) with 8 HR, 15 RBI and 19 runs in final 24 games of the season. Cardinals were 18-6 in those games... Played in his first MLB postseason and started at first base in 15 of 16 games...went 13-59 with two doubles, one homer and four RBI during the postseason...recorded a .316 average in five Division Series games vs. Pittsburgh...scored twice, reaching three times (BB, HBP, 1B) in DS Game 1; had single and double in Game 2 and blasted a 2-run home run in Game 5 win...during the League Championship Series vs. Los Angeles Dodgers had one of Cardinals four hits in Game 3, 2-4 in Game 5 at LA and 2-3 in the decisive Game 6 at Busch...collected single RBI's in LCS Games 5 & 6...recorded three hits during the World Series with Boston Red Sox, including 2 singles in Game 3. Made his Major League debut during 2012 but spent most of the season at Memphis (AAA), where he saw his season shortened due to injury. Despite time in the big leagues and on the disabled list, in 67 games led Memphis in HRs (18), 4th in doubles (22) was 5th in RBI (50) and his .329 average topped regulars. Ranked T15th among Pacific Coast League players with 18 home runs. Was purchased from Memphis on 5/20 (Berkman DL) and made his Major League debut that night at LAD, starting at firstbase. Was batting .340 with a team-high 9 home runs and 27 RBI in 37 games at time of his call-up. Played in 27 games with St. Louis, starting 23 (all at 1B), picking up 21 hits, six doubles, two home runs and 13 RBI. Hit his first Major League home run on 5/27 vs.PHI, a solo shot in the 6th inning off Chad Qualls. Optioned to Memphis on 6/21 where he spent rest of season. Hit .325 in April,.361 in May with Memphis and .414 in June when he returned to the Redbirds. Was on the disabled list from 7/1-16 with right elbow soreness and then from 8/11 to end of season. Had surgery on 8/13 to remove bone chips from his right elbow. Rated as the 9th-best prospect in the Cardinals organization by Baseball America. Named the Cardinals Minor League Player of the Year and was selected Texas League Player of the Year by Topps...Was one of only two players in the Minor Leagues to post .300 BA, 30 HR and 100 RBI (Bryan LaHair, Iowa)...Named the Texas League Player of the Year, the first Cardinals minor leaguer to earn the honor since Tyrone Horne in 1998...Selected to the Texas League Mid-Season All-Star team and went 1-for-4 with a homer in the game. Also named a Texas League post-season All-Star...Set a Springfield single season record with 32 home runs and 101 RBI...Topped the Texas League in RBI and slugging percentage (.566), ranked 6th in batting (.300), 2nd in homers and total bases (262) and 4th in extra-base hits (57). Averaged one home run every 14.47 ABs, the best HR/AB ratio in the Texas League...Ranked in the top-10 among Cardinals minor leaguers in home runs (1st), slugging percentage (1st), runs (2nd, 80), RBI (2nd), hits (4th, 139), OPS (4th, .923) and ranked fourth among Cardinals full season minor leaguers with a .300 BA...Played in 115 games with Double-A Springfield, 111 at first base (4th highest total among first basemen in the Texas League)...Registered a .993 fielding percentage at first base with just eight errors in 1,100 total chances...Was placed on the 7-day disabled list (6/5-24) missing 19 games due to an oblique muscle strain...Blasted his first career grand slam on 7/12 vs. Midland off Andrew Carignan...Ran off a 13-game hitting streak (6/1-7/4), T11th longest in the TL, batting .429 (24-56) with 3 HR and 12 RBI during streak...Reached base safely in 25 straight games, T6th best in TL, with an on-base pct. of .424, while batting .358, 7 HR, 22 RBI...Honored as Cardinals Minor League Player of the Month for May...Was selected to play for the Peoria Javelinas in the Arizona Fall League...Started 20 games at first base for Peoria batting .250 with 4 HR and 19 RBI. The home runs and RBI ranked 2nd on the team. Led the league with six sacrifice flies...Was selected to the AFL Rising Stars All-Star Game, but could not participate due to injury...Named as one of two Arizona Fall League Top Prospects at first base, selected by AFL managers and coaches...Rated as the ninth-best prospect in the Cardinals organization by Baseball America. Led the Midwest League with 88 RBI, 63 extra-base hits and a .541 slugging percentage...led all Cardinals minor leaguers in slugging percentage and doubles (41)...named a Midwest League Mid-Season and Post-Season All-Star...was 0-for-2 asthe starting first baseman for the West All-Star team...batted .333 in June, then hit .340 with 7 HR and 26 RBI in both July and August...hit for better power vs. RHP at .302 with 17 HR, but hitbetter for average vs. LHP at .333 with 5 HR...posted a career best five-hit game going 5-for-5 at Clinton (7/7)...had 36 multi-hitgames and 16 games of three hits or more...posted two 5 RBI games (8/4 vs. Clinton & 8/11 vs. Wisconsin)...tied his career-best with a 14-game hitting streak (7/31-8/14) batting .400 (24-60) with 5 HR and 19 RBI during the streak. Split the season playing 63 games between JohnsonCity (R) and Batavia (SS-A)...led all Cardinals minor leaguers with a .355 batting average, .574 slugging percentage and a .947 OPS...hit a two-run home run in first professional plate appearance at Kingsport (6/23)...hit safely in 26 of 32 games in Johnson City and 29 of 31 in Batavia...14-game hitting streak (8/3-19) ranked 2nd longest in the New York-Penn League (.367, 22-60, 2 HR, 12 RBI)...also had the longest home hitting streak in the league at 19 games from August 3 through the end of the season...recorded first multi-home run game at Mahoning Valley (8/25) drilling home runs in back-to-back innings (4th and 5th). December 18, 2018 Washington Nationals signed free agent 1B Matt Adams. October 29, 2018 1B Matt Adams elected free agency. August 22, 2018 St. Louis Cardinals activated 1B Matt Adams. August 21, 2018 St. Louis Cardinals claimed 1B Matt Adams off waivers from Washington Nationals. July 4, 2018 Washington Nationals activated 1B Matt Adams from the 10-day disabled list. July 3, 2018 Washington Nationals sent 1B Matt Adams on a rehab assignment to Harrisburg Senators. June 19, 2018 Washington Nationals placed 1B Matt Adams on the 10-day disabled list retroactive to June 16, 2018. Fractured left index finger. December 22, 2017 Washington Nationals signed free agent 1B Matt Adams. December 1, 2017 1B Matt Adams elected free agency. May 20, 2017 St. Louis Cardinals traded 1B Matt Adams and cash to Atlanta Braves for 1B Juan Yepez. September 2, 2016 Matt Adams roster status changed by St. Louis Cardinals. August 25, 2016 St. Louis Cardinals sent 1B Matt Adams on a rehab assignment to Memphis Redbirds. August 11, 2016 St. Louis Cardinals placed 1B Matt Adams on the 15-day disabled list retroactive to August 10, 2016. Left shoulder inflammation. October 14, 2015 St. Louis Cardinals activated 1B Matt Adams. October 9, 2015 St. Louis Cardinals reassigned 1B Matt Adams to the minor leagues. September 9, 2015 St. Louis Cardinals activated 1B Matt Adams from the 60-day disabled list. June 5, 2015 St. Louis Cardinals transferred 1B Matt Adams from the 15-day disabled list to the 60-day disabled list. Torn right quad. May 27, 2015 St. Louis Cardinals placed 1B Matt Adams on the 15-day disabled list. Strained right quad. June 13, 2014 St. Louis Cardinals activated 1B Matt Adams from the 15-day disabled list. June 9, 2014 St. Louis Cardinals sent 1B Matt Adams on a rehab assignment to Memphis Redbirds. May 7, 2013 St. Louis Cardinals activated 1B Matt Adams from the 15-day disabled list. May 3, 2013 St. Louis Cardinals sent 1B Matt Adams on a rehab assignment to Springfield Cardinals. April 26, 2013 St. Louis Cardinals placed 1B Matt Adams on the 15-day disabled list retroactive to April 22, 2013. Strained right oblique. October 24, 2012 St. Louis Cardinals recalled 1B Matt Adams from Memphis Redbirds. September 4, 2012 Matt Adams roster status changed by Memphis Redbirds. August 14, 2012 Memphis Redbirds placed 1B Matt Adams on the 7-day disabled list retroactive to August 11, 2012. July 16, 2012 Memphis Redbirds activated 1B Matt Adams from the 7-day disabled list. July 3, 2012 Memphis Redbirds placed 1B Matt Adams on the 7-day disabled list retroactive to July 1, 2012. June 22, 2012 St. Louis Cardinals optioned 1B Matt Adams to Memphis Redbirds. May 20, 2012 St. Louis Cardinals selected the contract of Matt Adams from Memphis Redbirds. April 2, 2012 Matt Adams assigned to Memphis Redbirds from Springfield Cardinals. January 18, 2012 St. Louis Cardinals invited non-roster 1B Matt Adams to spring training. June 24, 2011 Matt Adams roster status changed by Springfield Cardinals. June 5, 2011 Springfield Cardinals placed 1B Matt Adams on the 7-day disabled list. April 4, 2011 1B Matt Adams assigned to Springfield Cardinals from Quad Cities River Bandits. March 18, 2011 1B Matt Adams assigned to St. Louis Cardinals. September 13, 2010 Matt Adams roster status changed by Quad Cities River Bandits. September 1, 2010 Quad Cities River Bandits placed 1B Matt Adams on the 7-day disabled list. April 5, 2010 1B Matt Adams assigned to Quad Cities River Bandits from Batavia Muckdogs. August 3, 2009 Matt Adams assigned to Batavia Muckdogs from Johnson City Cardinals. June 23, 2009 Matt Adams assigned to Johnson City Cardinals from St. Louis Cardinals. June 21, 2009 St. Louis Cardinals signed C Matt Adams.